Powers/Abilities: Tumbler is highly trained at athlete level or close to peak human, with exceptional acrobatic skills, and a good hand-to-hand combat skill. (Tales of Suspense I#83 (fb)) - After high school, John Robert Keane, had no family or friends. He became a minor criminal. Once a gang refused to let him join, and the criminals walloped him. Angered, he sought revenge and decided to become as strong as Captain America. Over the following years he started to train hard, eventually entering a circus and learning the art of the trapeze from one of the best acrobats of the world. Then he became stronger than the circus Strong-man, and he heightened his speed and agility by dodging the jugglers' ninepins. (Tales of Suspense I#83 (fb) - BTS) - The gang that refused Keane was arrested by the Police, so he chose to measure himself with Captain America. Keane wore a costume and became the Tumbler. (Captain America I#291 (fb)) - While his brother Michael was in the army, John used the ill-gotten gains he had reaped as the Tumbler to pay not only for his own living, but also for their mother's, and their home. (Captain America I#291 (fb) - BTS) - At some point, John took out a one million dollar policy with the Guardian Life Insurance Company, who was aware of his Tumbler identity and activities. (Tales of Suspense I#83) - The Tumbler invaded Avenger's mansion and attacked Captain America. He easily hit Captain America many times and also managed to take his shield. After a second struggle he defeated the Blue, Red and White fighter, not knowing that it actually was the Super-Adaptoid who had shape-shifted as Captain America but lacked his fighting will or talent. The real Captain America freed himself from the Super-Adaptoid's bonds and attacked Tumbler. This time although Tumbler used all his abilities in the fight he didn't last very long and eventually was knocked down by the Avenger. (Tales of Suspense I#83 - BTS) - The Police took Tumbler in care. (Captain America I#169 - BTS) - Tumbler was hired by Quentin Harderman to discredit Captain America. (Captain America I#169) - Informed by of Captain America's whereabouts by Harderman, the Tumbler robbed a shop in Madison Avenue near Harderman's Agency, wounding the owner just as Captain America left the Agency. The Avenger pursued the Tumbler and almost won the fight, but the Tumbler escaped. The day after, in civilian garb, the Tumbler was lured by Harderman into meeting Captain America for a charity boxing match between the two athletes. 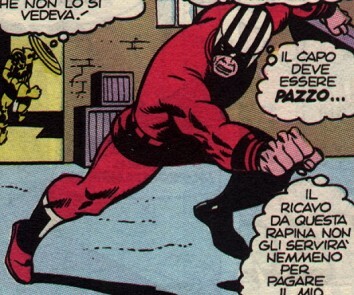 Cap recognized Keane's name ,and the Tumbler, realizing that something wasn't right, ran away. He was immediately tripped by Cap's shield; he retaliated, but was blocked by the shield. The civilian clothes slowed him down, and Captain America succeeded in grabbing his ankle and smashing him to the ground. Meanwhile from the roof just above the fight, Moonstone (Lloyd Bloch) was hiding waiting for the right moment, following Harderman's orders. When he saw Keane being hit by Captain America, he shot a laser ray so thin that nobody could see it, which killed the Tumbler. Keane's death seemed to have been caused by Captain America's blows. (Captain America I#170) - Harderman and many other people around the dead body of John Robert Keane accused Captain America of murder. (Captain America I#174 - BTS) - Captain America remembered Keane's murder as a part of the Secret Empire plan to discredit him. (Captain America I#291 (fb) - BTS) - Guardian Life Insurance refused to pay on his account, since he had been killed while engaged in an illegal act. (Captain America I#291 - BTS) - Captain America helped Michael Keane, the new Tumbler, expose Guardian Life Insurance's practice of insuring super-villains and then refusing to pay on the policies. 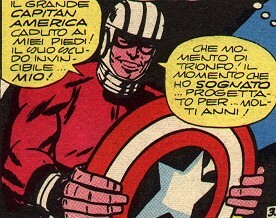 Comments: Created by Stan Lee, Jack Kirby and Frank Giacoia. Killed by Steve Englehart/Mike Friedrich, Sal Buscema and Frank Mc Laughlin. This version of the Tumbler has an entry in Marvel Legacy: The 1960s Handbook. One of the Tumbler's was pulled forward in time to fight in JLA/Avengers#4 for Krona, but it is unknown which one it was. Profile by Spidermay and Snood.